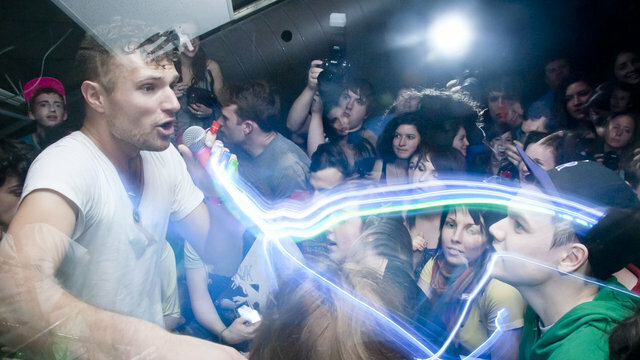 Rich Aucoin dazzles a packed crowd at the Kapisanan Cultural Centre on April 16, 2011. We’d pegged this past weekend’s Snakes + Ladders triple bill for review over a month ago, as all three bands have been garnering rave reviews for their live shows. Familiar with Rich Aucoin (whose residency in February at the Drake Hotel we profiled), a fan of Gobble Gobble’s recorded music, and reading great things about Terror Pigeon Dance Revolt, we made sure we were there early—in fact, so early that barely anyone else had arrived. A quick trip around the corner to Spadina Avenue for dumplings (to sustain the high-impact dancing to come), and we were back at the Kapisanan Cultural Centre for 10 p.m., where the sidewalk crowd was filing down to the basement venue. 10:07 PM: We take the stairs down to the basement as Terror Pigeon Dance Revolt is starting their first song. There’s an intriguingly lit metal chain-link and copper-sheet backdrop at the “stage” end of the room, but it doesn’t function as a stage; in fact, we never manage a close look, because frontman Neil Fridd, wearing a green M&M costume, launches himself into the middle of the crowd at the start of the set and stays in the thick of it throughout. 10:12 PM: Fridd starts the second TPDR song with a fast-paced cover of Sinéad O’Connor’s “Nothing Compares 2 U,” which quickly morphs into a typically hyper-frenetic party anthem. The crowd, already whipped into an enthusiastic fervour, is jumping, though not too high; the mostly exposed ceiling-panel frame hangs approximately seven feet off the ground. Terror Pigeon Dance Revolt’s Neil Fridd holds court under a patchwork parachute held aloft by cavorting audience members. 10:24 PM: A tangle of jackets is dumped into the middle of the room, and Fridd encourages eager dancers to don them. Turns out they’re all attached at the sleeves and rigged with flashing lights, creating a strobe chain that snakes around the basement space. The song ends, the jackets are quickly removed (it’s already quite warm and humid in the basement), and now a patchwork parachute is quickly spreading over the audience’s heads to envelop nearly the entire space. 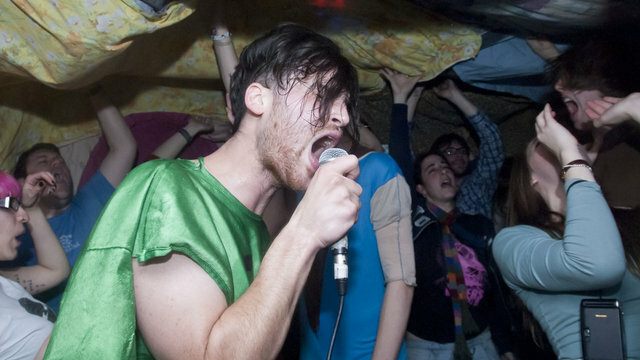 Everyone crowds under, and the dance party continues in a billowing blanket fort. 10:34 PM: The TPDR set ends with a group hug of more than 60 people in the centre of the room, with Fridd in the middle, leading a chant: “We’re Alive! We’re in Love! We’ve Got Hope! Just Because! !” Much of the crowd heads to the back end of the room and upstairs to the sidewalk to cool off. The cue cards from earlier have found nesting places in the exposed ceiling structure. 11:02 PM: The stage has been transformed, with Rich Aucoin‘s gear deployed in front of his signature sheet/screen, his brother Paul plugged into a bass amp at “stage” right, and a hybrid drum kit for Joel Waddell set up at “stage” left (Aucoin will introduce the pair several songs into the performance). The band has already played a set earlier in the evening, opening for Born Ruffians at the Opera House, but Aucoin shows no signs of exhaustion, launching into “At War With The Cynics (An Opening)” with a mash-up of goat and seal screams (most of Aucoin’s songs start with projected clips from viral internet videos) and handfuls of confetti. 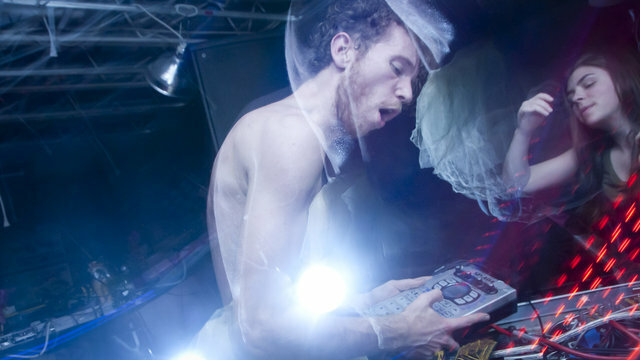 11:13 PM: Aucoin takes advantage of the break between songs to talk about how great it’s been touring with Terror Pigeon Dance Revolt in the U.S.. The crowd has grown to easily more than a hundred in the basement space, and the dancing gets so frenzied during the next song (“a new tune,” Aucoin announces) that cameras can be seen snapping away from above and inside the ceiling, looking down at the crowd (which is “maximizing” the headspace as best it can). The crowd raise their voices, joining in with Rich Aucoin. 11:21 PM: “That last tune was Spiral Beach, everyone—one of the best bands ever,” says a grinning and very sweaty Aucoin. We didn’t catch the song title, or recognize it off the top of our heads, but since the show’s organizer, Dan from Snakes + Ladders, is a Spiral Beach alumnus, it’s a classy thing to say (and we wouldn’t dispute it). 11:33 PM: Aucoin has jumped in and out of the crowd throughout his set, and dives in for the next tune, “Four More Years,” one of the newer songs in his repertoire. The crowd isn’t showing any signs of flagging, and neither is Aucoin. 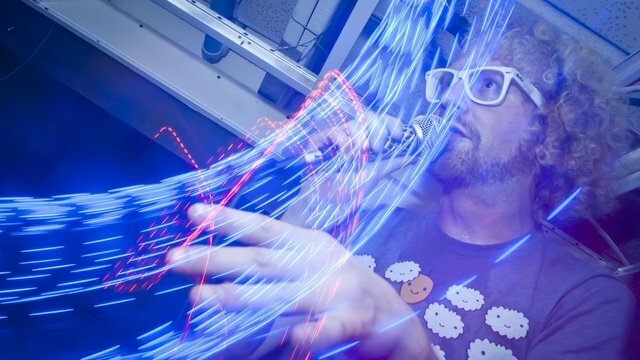 His next song brings about the appearance of his own rainbow-coloured parachute, and a remixed version of the viral video hit “Double Rainbow” to start it off. 11:38 PM: Aucoin thanks everyone and tells them they’re in for more “insanity” when Gobble Gobble hits the stage. His set closer, “It,” gets everyone crowded into the centre of the room and crouching, shouting, “We won’t leave it all in our heads!” at the top of their lungs. Gobble Gobble’s lead singer (and wizard) Cecil Frena. 12:11 AM: Gobble Gobble lead singer (and composer) Cecil Frena starts things off a little slower than the first two acts, pacing amongst the first few rows of audience members, staring them in the eyes, slowly waving a glowstick hand, and serenading them through an auto-tuned mic. The set soon erupts into the anarchy we’ve been promised, with bare-chested and tutu-clad “Gobblers” cavorting through the room, one pair banging on an oversized bodhrán with a snow shovel. Incredibly, in the close-ceilinged space, the shovel wielder is on stilts! 12:19 AM: The crowd is treated to a blast from a besparkled leaf blower; it’s most welcome, as everyone is drenched in sweat (and the beer ran out as Gobble Gobble’s set was starting). Gobble Gobble’s hypemen, wearing helmets as percussive instruments (and little else). 12:23 AM: Frena introduces the third song in Gobble Gobble’s set as “Semi-Charmed Life.” The Bacchanalian revels continue unabated; our photographer, Corbin Smith, is right up onstage, shooting inches away from Frena and other members tweaking samplers and sequencers. 12:30 AM: More objects have found their way into the ceiling to join TPDR’s cue cards, including one of the shovels and a giant foam ear. 12:40 AM: Rich Aucoin is in the middle of the now-moshing crowd—the man seems to run on inexhaustible batteries! A Gobble Gobble member tweaks a sampler while a fan loses herself in the rhythm. 12:45 AM: The band comes back for an encore, playing their mind-blowing cover of the Pixies’ “Where Is My Mind?” The crowd goes nuts, with the mosh pit reaching crowd-surfing density, something one of the Gobble Gobble dancers takes advantage of. When the song ends, almost everyone slowly files outside, steam rising off warm and happily exhausted bodies. 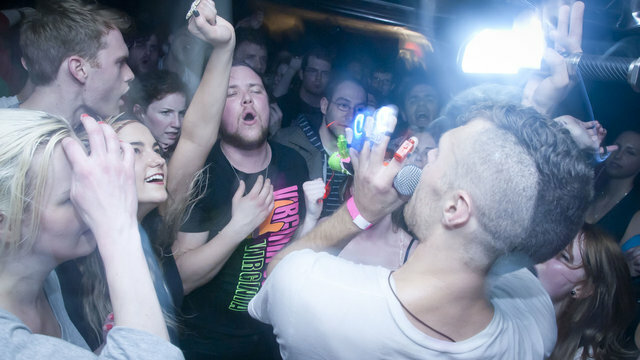 Reflecting back on the night, it seems like all three bands have tapped into the communal experience of rave culture in the ’90s (yes, some of us on staff at Torontoist are old enough to remember it firsthand). But rather than getting the crowd going from a DJ booth above and being removed from the crowd, all three acts relish mixing with their devotees. The high levels of showmanship and various crowd-pleasing tactics (the parachutes, the finger lights, the call-and-answer refrains) supplement the music, which is just as much fun to listen to at home—but nothing quite matches the live experience all three acts offer. All photos by Corbin Smith/Torontoist.